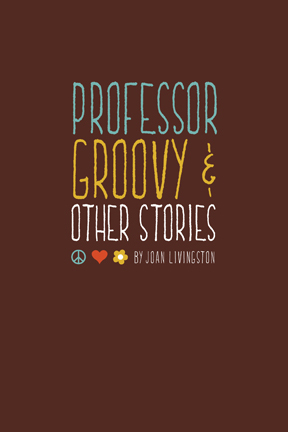 I just got word Professor Groovy and Other Stories is now available on Kindle. How much fun is that? Lenora Dias, one of the novel’s main characters, is the prominent figure in each story. We get a taste of the late sixties via her point of view. For those who haven’t read the novel, Lenora is the first of her Portuguese family to go to college at the fictional Westbridge State. She goes hippie big time, but is levelheaded enough to stay out of too much trouble and to graduate on time. A serial romantic, she falls hard in love and suffers for it. She is the queen of her little tribe of hippie friends. In one story in this collection, Lenora has an encounter with a professor who enjoys having no boundaries with his students. Yes, you could call him a dirty professor. In another, Lenora reveals a secret and in another, a liar. Then, there is her raucous summer fling with a guy back home. Yes, these stories were inspired by my experiences long ago, but they are strictly from my imagination. I wrote them before I started Peace, Love, and You Know What. I guess you could call them practice runs although two did get picked up by publications. I opted at this point to go with Kindle only because the short stories total 10,000 words. In the future, I may incorporate them with other stories to make a heftier book worth printing. The price to read Professor Groovy is 99 cents, which I believe is fair. Thanks for reading my fiction. A few days ago I got a message from a college friend expressing displeasure with my novel, Peace, Love, and You Know What. I guess he and at least one other person didn’t believe what I’ve said all along: this book is fiction and not a memoir. First off, I have not led a life that has been so interesting, it deserves a memoir. I once had a New York agent who wanted me to write a tell-all non-fiction book about the town I lived in at the time in Western Massachusetts — something on the order of Peyton Place. He read the first couple of chapters and wanted a lot more dirt. Certainly there was fodder for scandal. But I couldn’t do it. I loved the people and the town too much. So instead I write fiction. Sure, I use what I’ve experienced, as I’ve said before, and have my way with it. I am inspired by what I observe. That includes people and places. I believe this is true of many or most fiction writers. The next novel I will launch is The Sweet Spot. It’s one of my three so-called hilltown novels. The one centers on a scandal involving the young widow of a soldier killed in Vietnam eight years and her married brother-in-law. Did it happen? No. But I’d like to think I wrote it with enough authenticity that one could believe it happened. Of the three books, the only character based on someone real is a dog. Back to Peace, Love, and You Know What. I understand that people, especially those who I knew way back then, will read what they want into my novel. But as I told my 92-year-old mother on the phone the other day: it didn’t happen that way. A funny aside: I mailed my mother a copy of the book with a note inside suggesting she might want to skip some of the pages. Afterward I had doubts. Maybe I shouldn’t have sent the book. Maybe she will be offended. But when I called my mother several days later, she told me she was half-way through the book. She thought it was very funny. I asked her if the novel was a bit racy, but she assured me she’s read a lot worse in her historical romance novels. I look pretty darn happy. Yup those are some of the brownies. I told that story at my solo reading held at SOMOS of Taos on July 8. It was a good night. I read small sections to get people through the three-day bash, which never happened by the way, and as I noted that’s only about a third of the book. 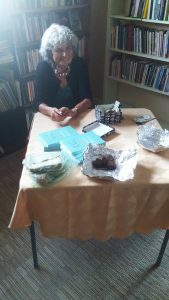 My friend, Teresa Dovalpage, asked questions about hippies and writing. I made brownies, without pot, of course, and signed books. Thanks to everyone who came. I hope to do it again soon. CORRECTION: In a May 29 post, I wrote about my visit to Bridgewater State University, which I attended and was the inspiration for the fictional Westbridge State College. I noted visiting several buildings on and off campus. My friend noted the “Brown House” burned to the ground. I mistook another apartment building next door for it. I stand corrected on that fact. 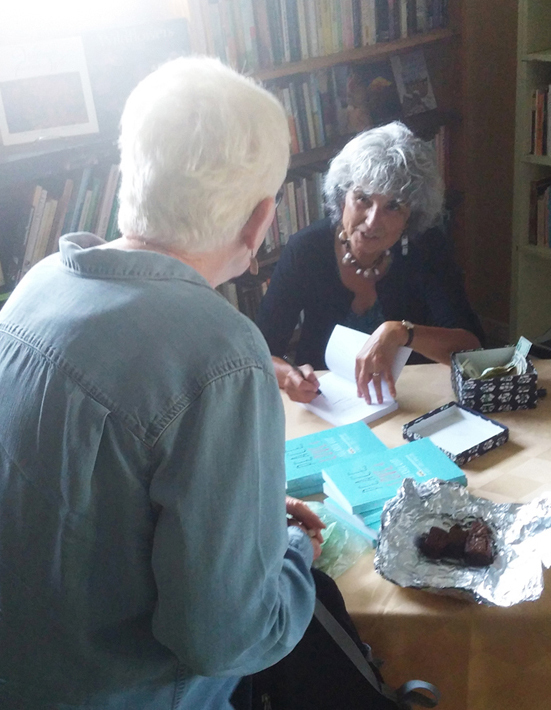 PHOTO ABOVE: Teresa Dovalpage took that photo of me signing one of my books for my former neighbor, Marcia.